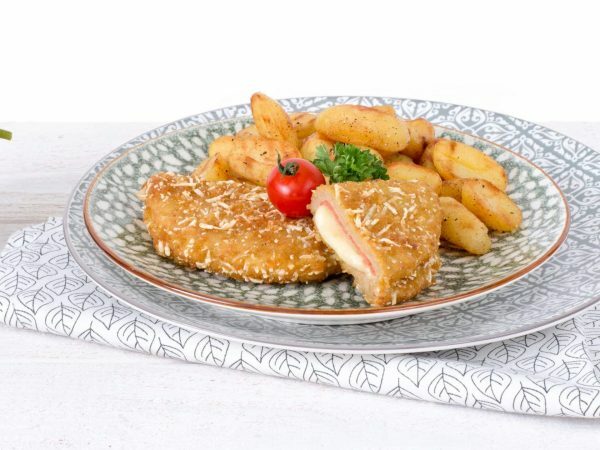 The Cordon Bleu is filled with vegetarian ham and cheese and is a full plant-based protein food. The weight of the vegetarian Cordon Bleu is 100 grams. Water, vegetable proteins 16% (soy, wheat gluten, pea), vegetarian cheese (cheese (milk, lactose), water, potato starch (E1420), butter (milk, lactose), emulsifying salts (E452, E339), salt), breadcrumbs (wheat), chicken egg white*, palm oil, wheat flour, sunflower oil, flavouring (egg, celery), starch (potato, wheat, corn), modified corn starch, milk protein (lactose), salt, dextrose, herbs and spices, garlic, smoke flavouring, acid (citric acid), mineral (ferrous fumarate), colour (E172), vitamin B12. * Free-range eggs. Produced in a facility that processes peanuts and nuts. Frying pan: 6-8 minutes on moderate heat. Turn every now and then. Oven : 10 min. at 180°C. Turn once.